The SISTWA(South India Scheduled Tribes Welfare Association) Children’s Home in Saidapet provides education and shelter to children of the narikuruva community in the area. The school has a strength of 315 children of whom 98 are residents of the Home. The school is additionally involved in several schemes for empowering women of the community through an access to an alternative source of income through the inculcation of jewelry making skills. The school recently saw the onslaught of the Chennai Floods to the utmost and is currently in the process of recovery. The geographical location of the SISTWA School made it greatly vulnerable to the flood situation. The school is situated in Saidapet through which the River Adyar flows. The Maraimalai Adigal Bridge across the River Adyar was affected drastically due to which the surrounding areas were over flown with flood water. The riverbed which can be seen beyond the school wall indicates a flood level at par with the wall as a result of which the school was completely flooded at the ground level. On visiting the site, it was observed that the process of recovery at SISTWA has been organized in a systematic manner owing to the amalgamated efforts of individuals, voluntary organizations in addition to the aid provided by the government. The spirit of volunteerism was especially significant, a fact attested to by the headmistress of the school. The evacuation procedure was completed swiftly due to knowledge of disaster management techniques provided to the staff of the school. The hostel students were evacuated to a nearby school which had not been affected. Children from areas outside Chennai were sent home after a few days of the occurrence of the event. The first steps taken were related to the process of sanitization aided by individual volunteers, Bhumi and other organizations. The Lions Club and the Chennai Municipal Corporation were the key aid. This was carried out for 15 days. The provision of electricity and water facilities were started after the process of cleaning was complete. However, there are still some areas within the school where work related to electricity is yet to be completed. The immediate requirements of food and necessary provisions were provided by individuals and voluntary organizations. Medical camps were set up by India Vision and there was a medical camp organized by the Government for basic necessities. It was ascertained by the Headmistress that there were no outbreak of diseases in the area as a result of the floods. Community participation was observed in the latter days after the floods when the school served as a distribution centre for food distribution. The impact of the floods on the residents of the school was recounted by the children themselves who described the event as ‘terrible’ and a sudden disintegration of their day to day lives. The children who lived in the hostel space found themselves being settled in a temporary settlement at a school nearby. 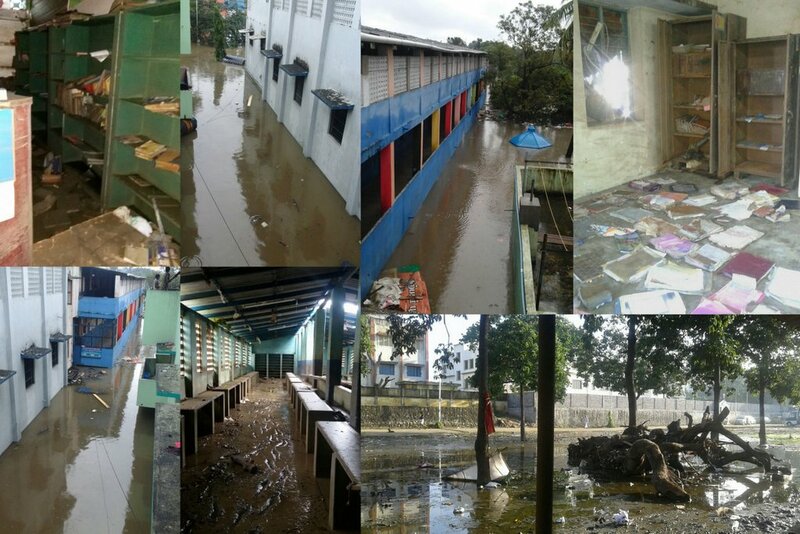 Their uniforms, books, educational tools were affected by the flood water. The kitchen was hard hit and the food provisions were destroyed as a result of which the kitchen and dining area along with the cooking apparatus had to be reconstructed to an extent. 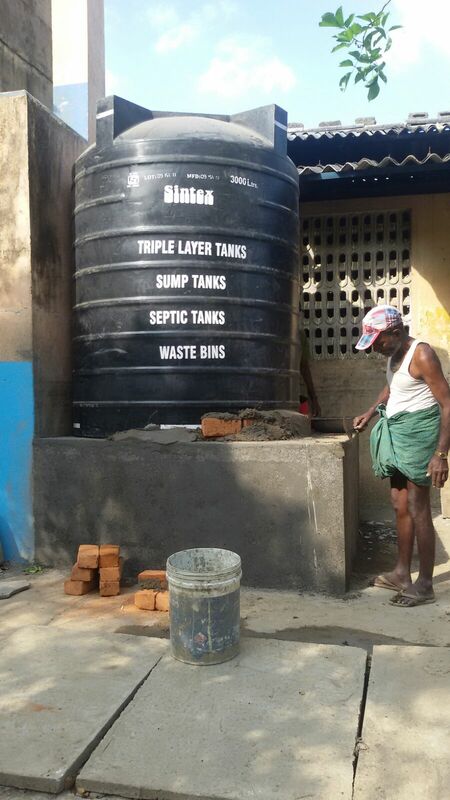 The water tank was completely destroyed and has been replaced, the construction of which was aided immensely by Bhumi. The library was affected and the books have mostly been replaced through donations. According to the headmistress, the physical and psychological impact on the children was minimal. However, the hostel children did face a sense of disorientation. Some of the children expressed horror at the onslaught of the flood and were upset about the destruction of their personal possessions. The voluntary effort was evident throughout the process of recovery. Individuals and voluntary organizations stepped forward to contribute to the different stages of relief provision. The provision of medical support was carried out by organizations such as the Lions Club and Kalimin Karangal which focused on blood donation camps. The educational needs of the children were catered to by the Agal Trust. The provision of flood relief requirements was undertaken by Tata Consultancy services, Petral Than Pillaya Trust, Helping Corner Foundation, Offer and several individuals. The Class I Officers of the L.I.C pooled in capital to provide cupboards for storage of educational material in the school. The Nadigar Sangam or the South Indian Artistes’ Association provided monetary relief. The reconstruction of the water storage tank which had been displaced was aided by the Bhumi Foundation which also incurred costs for plumbing services in the school. The provision of housing facilities to several families in the community surrounding the school was undertaken by the Government. As a result, the tangible and intangible support provided by voluntary as well as governmental institutions enhanced the process of recovery and diminished long term impacts. On visiting the school, it was noticed that the process of reconstruction and recovery is nearly complete. The newly painted buildings give an impression of resistance and survival of a drastic natural disaster. However, the headmistress expressed that disaster management training needs a boost. The power of resistivity of the buildings is yet unascertained and a disaster of equal proportion in the future has unpredicted consequences. As a result, it would perhaps be beneficial to make a record of the process of recovery, the stages of reconstruction of normal life in the school and the community and observations regarding means to combat similar disasters in the future. Above all, the role of volunteerism emerged as a dominant factor in recovery and holds hope for combatting disasters of diverse proportions.